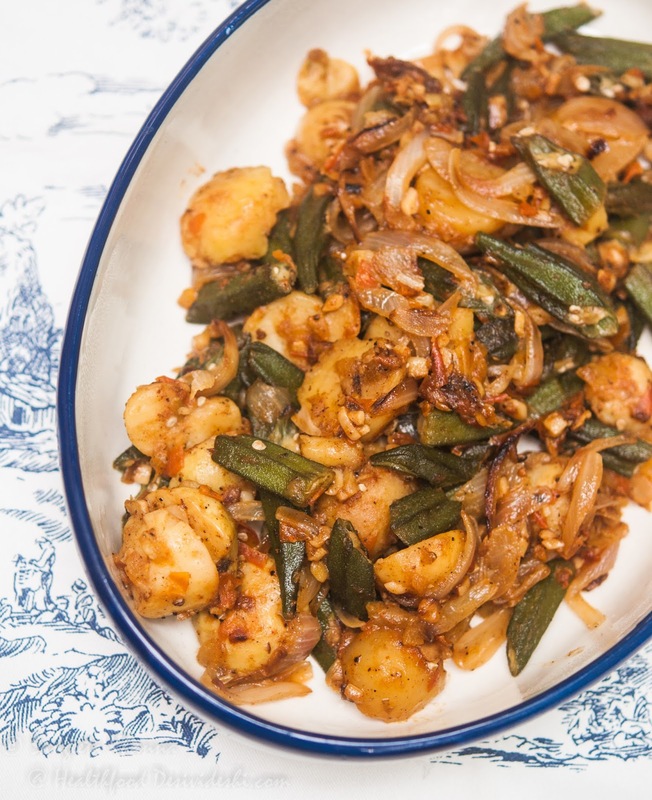 This okra (bhindi) and baby potatoes with butter garlic kept ringing in my head until I made it at home the very next day after meeting Bridget White Kumar. This Anglo Indian recipe is being served at the J W Marriot Aerocity right now where she has curated a menu around this cuisine, I loved it so much that I had to share it with you all too. Note that this version of okra in butter garlic is my recreation after tasting it at the festival and not the authentic way Bridget makes it, there might be a minor variation in her original recipe of okra in butter garlic. Heat a pan and add the butter and garlic together, let them sizzle while stirring till the garlic gets aromatic. Add the sliced onions and baby potatoes and toss well to coat evenly. Keep cooking for a couple of minutes. Add the chopped okra, salt and pepper and toss well to coat. Keep tossing or stirring lightly for 5 minutes, add the tomatoes, mix well and cover to cook for 5-7 minutes on medium heat. The okra should be cooked by now, the onions a nice shade of pink and the tomatoes completely mushy. Cook a few minutes more if the okra is not cooked well. Add milk, stir and cover to cook for a minute, adjust consistency by adding a little more milk if you wish. Check and adjust seasoning. Serve hot with soft rotis or bread rolls.